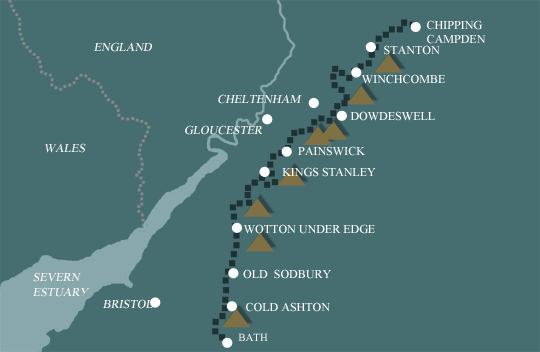 This is a 5 day walk along southern section of the Cotswold way. The days are a perfect length to enjoy the hikes through the stunning woodland and past several Neolithic Burial Burrows along the way. Finishing in the sublime City of Bath this walk is an excellent choice for those that do not wish to complete the whole Cotswold route, but want to get a taste of this delightful part of the country. By Air: The nearest International Airport to Painswick is Bristol (25miles/40km). Alternatives are London Heathrow or Gatwick. By Public Transport: The nearest train station is in Stroud, from where it is a short taxi ride to Painswick. National Express Coach services run to Gloucester and Cheltenham, from where a local bus service connection to Painswick can be made. By Road: Painswick is on the A46 between Stroud and Cheltenham. From the North: Come off the M5 at Junction 11a and take the A417 towards Cirencester. Then take the A46 towards Stroud until it reaches Painswick (5miles/8km) From the South West: Come off the M5 at Junction 13 and take the A419 towards Stroud. From Stroud take the A46 towards Cheltenham which passes through Painswick after 3 miles/ 5km. By Rail: there are fast and frequent services which connect Bath to London (journey time 1hour 30 minutes) or Birmingham (2 hours).